This exquisite solid sterling silver Glen Isle Luckenbooth brooch is from the Scottish Celtic Revival period. This design features the traditional and classic Luckenbooth motifs, two hearts intertwined for love surmounted by a crown for loyalty. Each Luckenbooth brooch has a solid bale at the back so that it can also be worn as a pendant. This beautiful large traditional brooch measures 2" long (49 mm) by 1-5/16" wide (34 mm) . 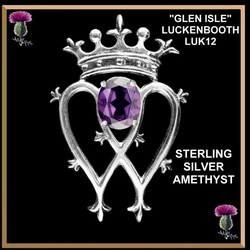 The Glen Isle Luckenbooth brooch design has a solid bale at the back so that it can also be worn as a pendant. Chain not included. This beautiful large traditional brooch measures 2" long (49 mm) by 1-5/16" wide (34 mm) . The Glen Isle Luckenbooth brooch design has a solid bale at the back so that it can also be worn as a pendant. The simulated amethyst stone is 10mm x 12mm. Chain not included. This beautiful large traditional brooch measures 2" long (49 mm) by 1-5/16" wide (34 mm) . The Glen Isle Luckenbooth brooch design has a solid bale at the back so that it can also be worn as a pendant. The simulated citrine stone is 10mm x 12mm. In Scotland citrine is know as Cairngorm. Chain not included. This beautiful large traditional brooch measures 2" long (49 mm) by 1-5/16" wide (34 mm) . The Glen Isle Luckenbooth brooch design has a solid bale at the back so that it can also be worn as a pendant. The simulated garnet stone is 10mm x 12mm. Chain not included. This beautiful large traditional brooch measures 2" long (49 mm) by 1-5/16" wide (34 mm) . The Glen Isle Luckenbooth brooch design has a solid bale at the back so that it can also be worn as a pendant. The simulated sapphire stone is 10mm x 12mm. Chain not included. This beautiful large traditional brooch measures 2" long (49 mm) by 1-5/16" wide (34 mm) . 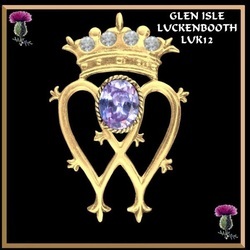 The Glen Isle Luckenbooth brooch design has a solid bale at the back so that it can also be worn as a pendant. The simulated emerald stone is 10mm x 12mm. Chain not included. This beautiful traditional brooch measures 2" long (49 mm) by 1-5/16" wide (34 mm) . This Glen Isle Luckenbooth brooch design has a solid bale at the back so that it can also be worn as a pendant. Chain not included.